I really don’t run in a lot of races, but I run a lot getting ready for those precious few. 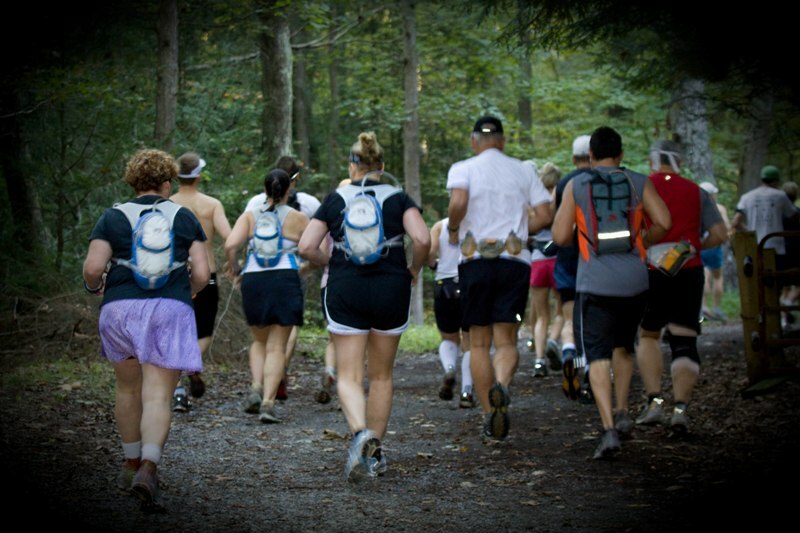 One of my favorite, never miss, local races is the Bays Mountain 15 Mile Trail Race. This year marked the fourth time I have participated in this race …. notice I didn’t say “finished”. Over the past three years I’ve seen a not-so-pleasant trend develop at Bays Mountain; my finishing times have been going along the lines of slow, slower, slowest. So, my goal for this year was to break that trend and finish just a touch more speedy than last year. The morning of the race I made a split-second decision not to wear a watch. Oh, I’m not ready or wanting to give up all my gadgetry, but I do admit that one can get a bit caught-up in the satellites of it all and lose touch with ground control. This day, I determined, was going to be about me getting my penguin self up and over those fifteen miles as quickly as possible. Every step was going to be with purpose! The toughest miles at Bays Mountain, to me at least, are the first four miles. Once I make it to the fire tower the rest is just pure fun …. well, except for those two nasty hills between miles 8 and 11, but other than that it’s just pure fun! When I made it to the fire tower I asked a volunteer for the time. He said 9:33. Wow, I had made it to the fire tower in just a touch over an hour! That’s when it happened …. little thoughts of a PR popped in my head. I decided to just go for it. When I turned on to Indian Pipes trail, which has a ton of downhill, I let gravity take over. I engaged my airplane arms for balance, leaned forward and began praying that my legs would keep up. Oh, it was so much fun! I was almost in sight of the next aid station at the turn for Kiner Hollow trail. The trail was wide, smooth, and clear. I must have let my guard down just for a brief second because before I knew what was going on I lost my connection to ground control. “Runner 487, this is Ground Control. Please report your location. Over.” In my mind the fall took forever. My first thought was …. Oh, this is not good. My second thought was …. Hey, this is just like a Pete Rose, head-first slide into home plate. Impact. I could feel all the air being forced out of my lungs. Third thought …. Don’t panic, you will be able to breathe again. Remain calm. By the time I stopped, rolled over and opened my eyes, Jenny was already standing over me telling me to stay calm. Between gasps I said …. “Get (gasp) me (gasp) up!!!!!!!! She grabbed my hands and helped me up. I ran as fast as I could but after a few minutes the pain became very noticeable. By the time we made it to the bottom of the hill the pain was nearly unbearable. A runner passed us and I asked her to alert the EMS that I was going to need some help getting out. I was finished for the day; the mountain had won. That was six weeks ago; my ribs have healed and I’m finally pain free. Now I’m ready to run down a hill as fast as I can run …. with no fear. Thanks, Mom!